No matter where you are in life, you are never 'finished'. Once you achieve success, you find yourself fighting to keep it, to be constantly improving, constantly refining your product, your service - yourself! to continue to create success. Similarly, a failure is not the end, a failure is merely an opportunity for improvement. Perhaps your product or service was merely yet to be defined. Perhaps your focus was on too many things. Perhaps your demographic simply wasn't ready for it, but soon they will be. There is no 'failure'. There is only opportunity. We must constantly be evolving, be creating, be thinking of and refining our ideas to stay on par with our competition and stay up to date on the latest and greatest for our target demographics. we much constantly be improving ourselves, both our inward and outward extern to cultivate our business or achievement persona. Unless your goal is merely to run a marathon wherein success is granted by the mere act of finishing, your goals will always be in a growth phase. That marathon runner may find a new passion for achievement, that merely running was not enough, that now the course must be longer, the time must be shorter, the recovery easier, the achievement, greater. Our nature is in competition. Not just for ourselves but for every aspect of our lives. 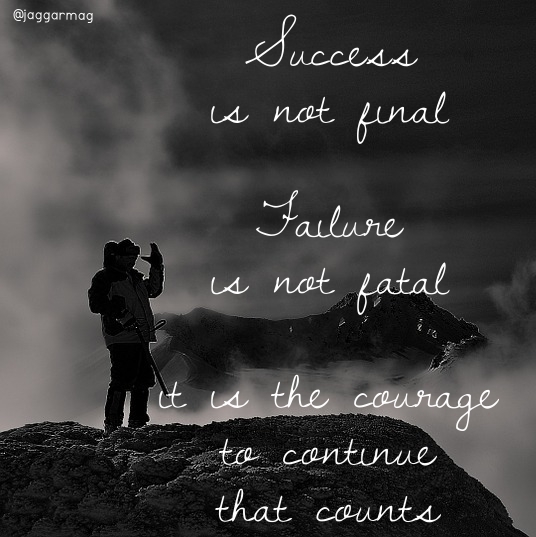 Have the courage to press on through failure and success, through hard times and bountiful times. This is where greatness and longevity lie.